J. Timothy Deppe, M.D., F.C.C.P. J. Timothy Deppe, M.D. is board certified in internal medicine and pulmonary medicine. 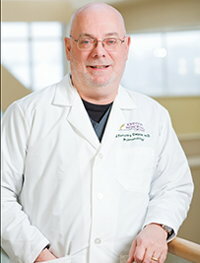 He attended Indiana University School of Medicine, and did his Internal Medicine internship, residency, and Pulmonary fellowship at the Indiana University Hospitals. He is a member of the America Medical Association, Society of Critical Care Medicine, American College of Physicians, and is a Fellow in the American College of Chest Physicians. He has previously had academic appointments at the Indiana University School of Medicine and the University of Illinois College of Medicine, and assistant program director of the Internal Medicine Residency program for the University of Illinois College of Medicine in Champaign-Urbana. Dr. Deppe has actively practiced medicine for 38 years.